Wire is a band with a reputation going back all the way to the (post-)punk era. What I can safely file in new wave as well. The kind of music I sort of abhorred at the time. It was only somewhere in the 00s that I picked up its first three albums on a cheap and sort of found my way into them, but still not the kind of album that I take out for a spin regularly. Fast forward to 2016. Although I missed the band's latest album, with the more recent releases I enjoyed myself. Like I do with Nocturnal Koreans. There's no more danger in Wire's music nor anything radical. So where does that leave the band's fans of 1979? Do they get their way around a The Moody Blues like moody ballad that 'Forward Position' is? I can't imagine they would, except that just like the band they are four decades older as well. Things change, develop, mature. That is not always the case with musical taste, I've noticed. Some preferences are ingrained, unmoveable, unshakeable. So good luck with this album for those who fit the description. Did Wire move my way? No, we've met somewhere in the middle.Wire started in 1976 in London in the year before punk really broke into mainstream conciousness. In 1977 it released 'Pink Flag', "perhaps the most original debut album to come out of the first wave of British punk" or so All Music wants us to believe. The first of 15 albums. There are two large hiatuses in the band's output of 8 and 12 years.In this decade the band is stepping up on production with four albums. In 2016 three of the original members are still in the band, Colin Newman, Robert Grey and Graham Lewis. Matthew Simms completes the band. 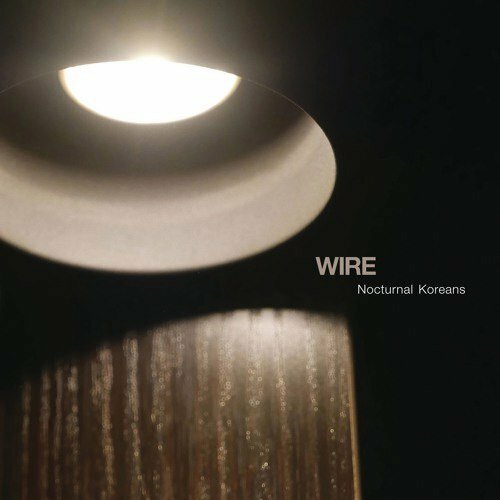 In a way Nocturnal Koreans is an album like Wire would have released in 1980. An eight song album which would have allowed the band to release an album a year, like was usual for most acts in the day. Only the biggest bands started to break that regularity at the time, to become the standard in later decades. Only a year after the release of 'Wire' there is a new album. Nocturnal Koreans is a moody album, somewhat subdued. The opening is a nod to the past. The title song is up tempo, as such the fastest song on the album. There are elements of what New Order does in its most poppy songs and The Cure kind attacks on the guitar strings. Under all that there is a pleasant layer of synths, giving the song a pleasant feel. Colin Newman sings with the subdued voice so typical of the post punk era. Fun was not allowed. We were facing the end of the world, remember? 'Internal Exile' is a bit of a surprise if we look at things from that angle. The song has a bit of a smile around it. The horns (synths?) and the guitar have glimmers of irony in their sound. The fierce pounding on the snaredrum drives the song on, giving it pace. The lyrics have some nice catches in them making concentrated listening required. 'Internal Exile' is as close to a party song as Wire comes on Nocturnal Koreans. This title is well chosen for this Wire album. It is an album for the night. The sound does not allow a lot of sunshine, nor moonlight for that matter. From the last remnants of a party or better a party faintly imagined, Nocturnal Koreans becomes a serious album with music for a bunch of people who do not want to go home just yet. People that do not need a lot of stimuli any longer. Just hanging on a couch, a last drink in a hand but with a mind seriously wondering whether it's smart to drink it all. The first glimmers of the new day enters the brain. That is the music Wire presents with a song like 'Forward Position'. The story would have held up were it not that 'Numbered' heads back into party territory with 'Numbered' and 'Still', but there's always someone around who tries to reactivate the remnants of the party. The songs remain on the dark side though. 'Still' could even have been a song for Kaiser Chiefs. Just add a little bit more exuberance and "whoas" or to stick to the story, light. With the little do-do's Wire comes close to a commercial song. It's far too late to score a hit for the band, but this song somehow ought to deserve just that. With 'Pilgrim Trade' the rhythm goes down again as does the mood. It never gets too dark. For that Colin Newman's voice is too light. There may not be a lot of emotion in his singing, there is no negativity as well. Newman is a neutral singer. The band holds neutral players. Yet is not hard to warm to this music. It all ends with 'Fishes Bones'. A song that reminds me the most of where Wire comes from. The drums stay out of the song for quite a while. The talk-singing brings Iggy Pop and Lou Reed to mind. The music has some of the recalcitrance of the late 70s, without coming close to the energy of the day. Summing up I think Wire has made a interesting and good album that intrigues me as well. For a band that I definitely did not like at all when it all started for it, that is quite a leap. It may have taken them 40 years to do so, as it did for me of course, that is a feat.